Free parking (brown areas in the map below) is available for NMSU Special Events on the east side of Arrowhead Drive across the street from NMSU’s Pan American Center. 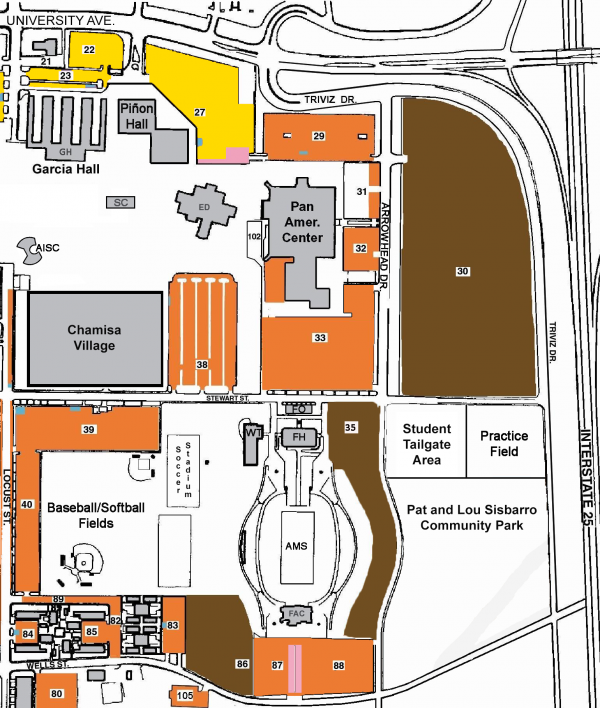 Parking in the lots adjacent to the Pan American Center require a permit between the hours of 8 a.m. – 4:30 p.m. Monday-Friday. Free visitor permits are available here. Handicap Parking is located on the north-half of Pan Am’s east lot. The Barbara Hubbard Room is located on the 2nd floor of the Pan American Center annex and is accessible on the east side of the building.